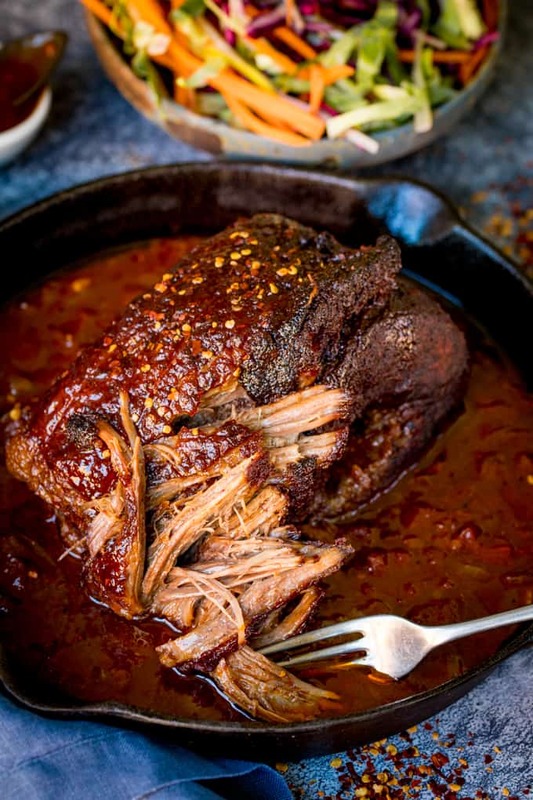 Caramelized Pulled Beef Brisket in a Rich Spicy Sauce. 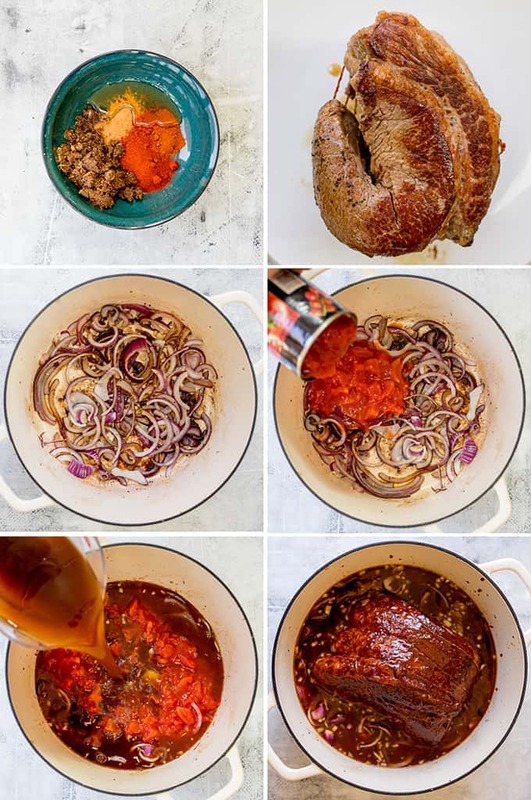 Take a couple of forks and shred this slow cooked beef brisket into tender ribbons and eat with everything…. Make sure you save yourself some of the caramelised pieces from the outside – they’re the best bits. Then maybe add a spoonful of sweet chilli jam on the side for an extra kick. This is one of those meals I like to cook on a cooler summer evening served with a crunchy salad and some french bread, or during the winter with a bowl of steaming hot boiled rice. It’s super easy to prepare. First season and seal the brisket in a pan, then mix together the glaze/rub and spread half of it on the beef. Fry up red onions with garlic and spices, then add in tinned tomatoes, beef stock, Worcestershire sauce, soy sauce and HP sauce for a spicy, tangy sauce. 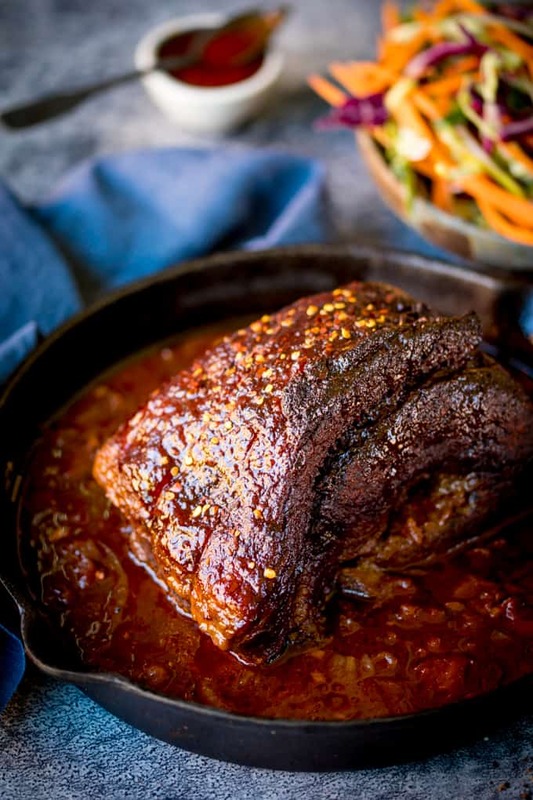 Add the brisket into the pan with the sauce and cook in the oven until tender, before brushing on the rest of the marinade and letting it finish off without the lid for beautiful caramelised exterior! 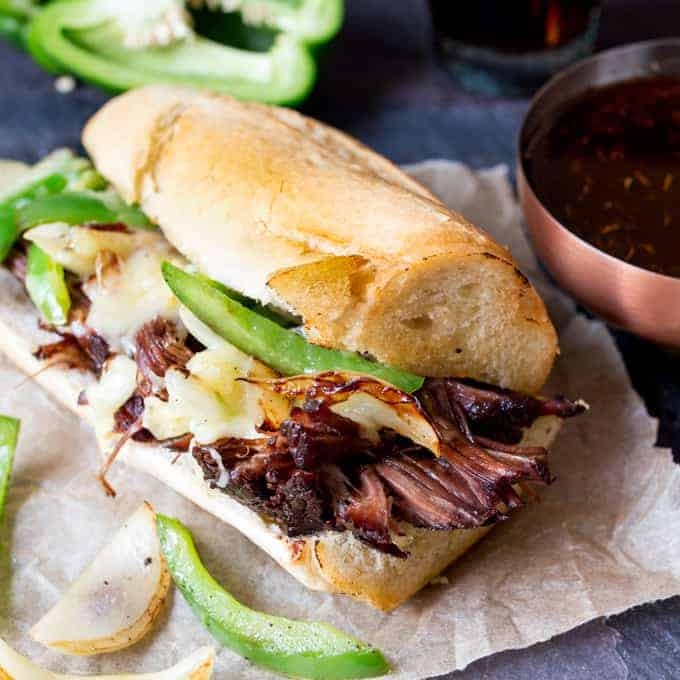 If you manage to save leftovers of this pulled brisket, warm up the beef and sauce and serve it on crusty rolls for lunch the next day. You’ll be the envy of your colleagues. This gorgeous brisket certainly isn’t a quick dish – in fact it’s in the oven for 3 and a half hours. 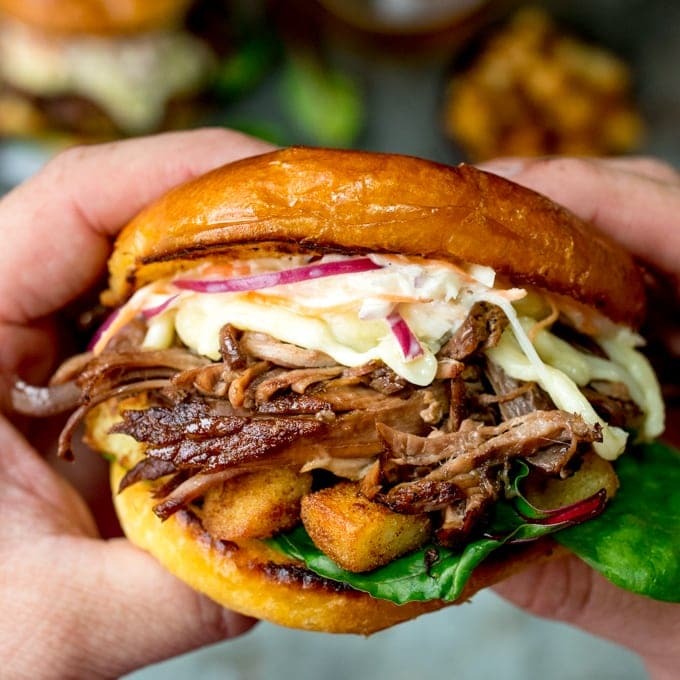 Cheaper cuts like brisket lend themselves really well to this kind of slow cooking -resulting in lovely tender meat and amazing sauces from the meat juices mixing with any ingredients you might add. I love the tomatoey, slightly smoky and spicy flavour of this sauce, but it’d work wonderfully with other flavours like red wine & mushrooms or even some spicy Thai sauce with coconut milk (a bit like my Massaman curry). This would also work great in the slow cooker or crockpot. I bet coming home to the smells of this filling your home would be amazing. It will still need a quick blast in the oven (see step 7) to get the caramelised layer though. There’s more info on cooking in the slow cooker in the recipe notes below. 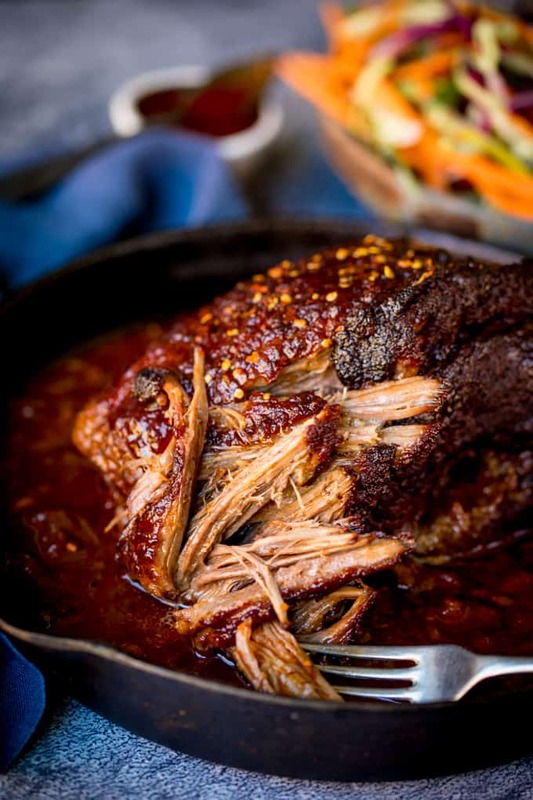 Sugar glazed pulled beef brisket in a rich, tangy sauce with a hint of spice. Heat oil in a large casserole pan on a high heat. Season the brisket with salt and pepper, place in the pan and then brown on all sides. Take the brisket out of the pan and place on a plate. Turn the heat down to low, place the sliced onion in, season with salt and pepper and gently cook for 5 minutes, stirring regularly until they've softened. Whilst the onions are cooking, mix the paprika, cinnamon, cayenne, dark brown sugar, honey and water in a small bowl. Spread half of it over the brisket. Add the garlic to the onions and give a stir. Allow to cook for 30 seconds, then add the tinned tomatoes, stock, Worcestershire sauce, soy sauce and brown sauce. Bring to the boil and then place the marinated brisket on top. Place a lid on the pan and place in the oven for 3 hours (check it occasionally. If it starts to look too dry, add in a splash of water). After three hours, take out of the oven and give everything a little stir. Spread the rest of the marinade on the brisket, sprinkle with the light brown sugar and a pinch of salt and pepper. Turn up the oven to 200C/400F and cook uncovered for 20-30 minutes until the brisket is dark and sticky looking. Take out of the oven, sprinkle with a few chilli flakes, then leave to cool a little. Shred the meat in the sauce using two forks. Serve with rice, potatoes or salad and sweet chilli jam if you like. Can I make the beef brisket gluten free? Yes - replace the stock with bouillon and the soy sauce with tamari. Worcestershire sauce and HP/Brown sauce is often gluten free, but it's best to check the specific one you use. 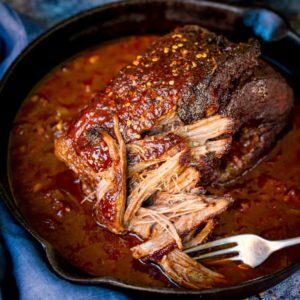 Can I make the beef brisket in the slow cooker/crockpot? Yes, sear the meat, then add the sauce ingredients, and cook on low for 7-8 hours, checking occasionally. It will need a blast under the grill/broiler for the final step when the marinade has been applied. Can I freeze the beef brisket? Yes, shred the beef and mix with the sauce, then cool, cover and freeze in portions. Defrost in the refrigerator overnight until completely defrosted, then heat through thoroughly before serving (reheat in the oven at 170C/325F for 20-30 minutes until piping hot throughout). This recipe was first published in October 2014. Updated in June 2018 with new photos and cook’s tips. I cooked this today and it was fantastic. My family loved the flavor of the sauce and marinade and tenderness of the beef. I followed the recipe except that the brisket was cooked in a slow cooker for 6 hours, then taken out and put in the oven to caramelize. We served it with rice and dinner rolls. Delicious! What amazing flavors! I love a nice tender brisket with it’s juices and bread to sop it all up. So delicious. I’ve totally got to check out that sweet chili jam though. I’m thinking I might try this in the Instant pot to avoid turning on the oven in the summer heat! One of our all time family favourites, love the new photos. Hi Nicky, could you cook this in a slow cooker? Always looking for new recipes for my newest appliance!! Yes – I’ve now updated the instructions to include this – so you’d need to sear the meat, then add the sauce ingredients, and cook on low for 7-8 hours, checking occasionally. It will need a blast under the grill/broiler for the final step when the marinade has been applied. Nicky, Can I make this in advance of my dinner? Yes, you can cook it in advance, although I’d recommend shredding it after cooking so you can heat it up more easily the next day. It may take a while to heat through all the way to the middle if you leave it whole. If you do want to leave it whole, cover and heat on a medium heat in the oven. You may need a splash of water in there too, so the sauce doesn’t dry out. This looks so good I’m trying it tonight. Do you mind if I share this on our blog, girsgonemildsite.com? Thanks Jill, hope you enjoy it. I’m happy for you to include one of my photos of the recipe on your blog, so long as it links back to my blog to get the recipe. Alternatively, I’m happy for you to photograph and write it up in your own words (would appreciate a link as the recipe source though please). This is one of the best recipes I’ve tried out for quite a while. So rich and comforting and delicious! I’m eating leftovers at work right now ans giggling because every single coworker has commented in how good it looks and smells, just like the recipe says! I’m really happy you enjoyed the recipe! Man, oh man. I’m a huge fan of brisket (I do live in Texas, after all! ), and this recipe sounds right up my alley! I’ve never made one at home, and clearly, I need to fix this and soon because this would be the perfect dish for a chilly winter’s day! Hi, can you use pork instead of beef pls? Btw, this looks so delish!!! Hi Maria, I’ve never done pork to this exact recipe, but I think it’ll be fine. Looks YUMMY! What’s “brown sauce”? Thanks for pointing that out! I’m based in the UK, and I sometimes forget that different countries don’t use the same terms for ingredients. Brown sauce is the same as HP sauce, which I think is available in certain places in the US. A1 steak sauce would be a good alternative if that’s easier to get hold of. Wow these beef looks delicious and packed full of flavour! You’ve definitely got me hungry just looking at the images – wish I had some to devour right now. Ha ha thanks Thalia. I’ll swap you for some that that fab looking French onion soup on your blog! It looks incredible. I love pulled meats. Thanks Corina, me too. Usually stick to pork, but this one’s a definite winner!